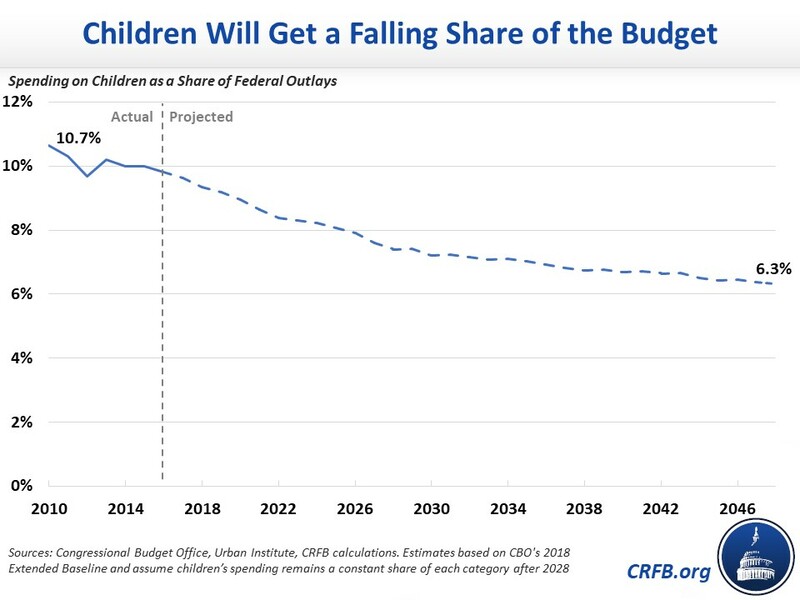 The Congressional Budget Office's (CBO) recent long-term budget outlook not only forecasts rapidly rising levels of debt but also suggests a declining focus on children in the budget. As we showed in our recent paper, Budgeting for the Next Generation: How Do Kids Fare?, children currently receive a small and shrinking share of federal resources. Extrapolating our estimates three decades into the future shows that investment in children will continue to fall relative to the rest of the budget. By 2048, we estimate only 6.3 percent of the budget will go to children. That's less than one-third of what will be spent on Social Security, on Medicare, or on servicing the debt. Under current law, CBO estimates total federal spending will rise from 20.6 percent of the economy in 2018 to 23.6 percent by 2028 and 29.3 percent by 2048. 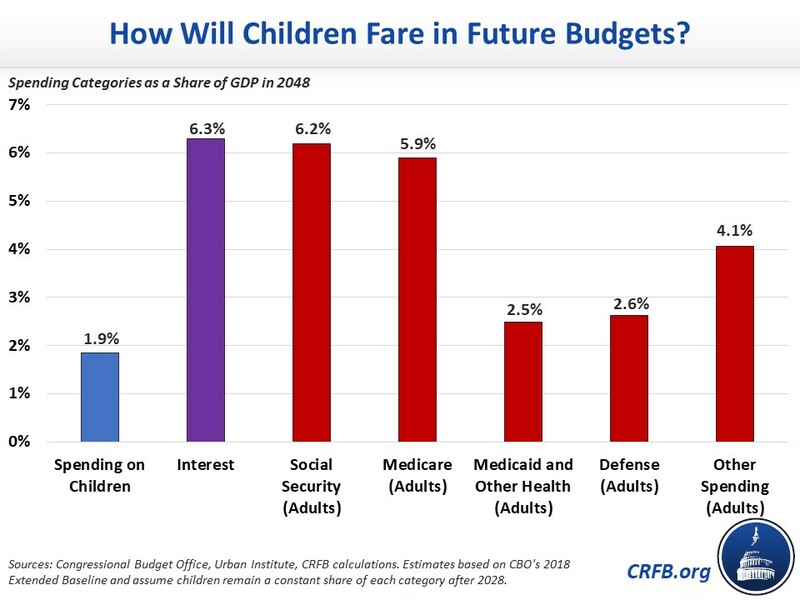 By assuming spending on children remains a constant share of each category of spending beyond 2028, we can provide very rough estimates of future spending on children. The results show that spending on children steadily declines as share of the federal budget over the next three decades and beyond. As we showed in our recent paper, spending on children has already fallen from 10.7 percent of total spending in 2010 to 9.8 percent in 2016. By our estimates, it will fall further to 7.4 percent of the budget in 2028, 6.8 percent in 2038, and 6.3 percent of spending in 2048. As a share of economy, we estimate spending on children would fall to 1.9 percent of GDP by 2048. That means the federal government will spend about a quarter less on children than it does either on defense or on the adult portion of Medicaid and the Affordable Care Act. Perhaps more troubling, spending on children will only be one-third as large as spending on adults collecting Social Security or adults collecting Medicare – implying that the federal government will spend at least six times as much on the elderly as on children. * Meanwhile, the federal government will spend less than a third as much on children as it spends on interest on the debt. In other words, by 2048 based on CBO's and our projections, the federal government will spend more than three times as much financing past spending and tax cuts as they will investing in the future generation. Importantly, these estimates may actually overstate future investment in children, as they assume children's spending remains constant as a share of Social Security and Medicaid – more likely, children will be a declining share. The projections also assume that policymakers effectively abide by current law through 2028 and then grow discretionary spending with the economy thereafter. Different assumptions about what policies are allowed to expire or continue and what course discretionary spending will take after 2028 would lead to different outcomes. Even if the estimates are imperfect, the trend is clear. Federal investment in children faces a challenging prognosis over the long run, while the debt burden being left to the next generation continues to balloon. * The actual figure would differ some from simply comparing non-child spending on Social Security and Medicare, since some Social Security and Medicare spending goes to non-elderly adults and a share of other budget categories – especially Medicaid – goes to the elderly.